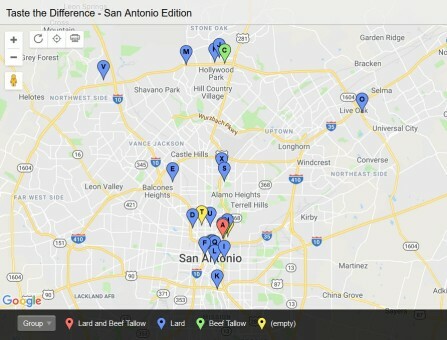 San Antonio’s Restaurant Week is offering up 120+ establishments to prove it, including two dozen showcased on a special Coast Packing Company online gastronomic #FatMap prepared for the occasion. Running Aug. 11-25, the observance benefits Culinaria (culinariasa.org), an independent, not-for-profit, registered 501c (3) tax-exempt organization, committed to promoting San Antonio as a premier food and wine destination while fostering community growth and enrichment. Among the can’t-miss places for lard lovers: Azuca Nuevo Latino, Cover 3, Hearthstone Bakery Café, Landry’s Seafood, Max’s Wine Dive and Periphery. Range is all in for beef tallow, while Outlaw Kitchens and Grayze render their own animal fats. During this year’s Restaurant Week, San Antonio eateries will feature three-course prix-fixe menus for lunch and dinner. For each meal, restaurants donate to Culinaria, which provides the means for students to enter into culinary fields. For the past 18 years, Culinaria has been promoting locally sourced food and wine experiences in the San Antonio region through community events and culinary education opportunities, including Restaurant Weeks, a 5K run, a festival, and many others. Proceeds from events directly support culinary and education programs, enabling Culinaria to be largely self-sustaining. Have a favorite restaurant that puts lard or beef tallow on the menu (or just in some of its prize dishes)? If so, drop Coast an email at info@coastpacking.com and the company will put it on the #FatMap. Consumers can also post an image or link to via Twitter/Instagram/Pinterest, etc., with the hashtag #LardOnTheMenu or #TallowOnTheMenu.